Mida d'aquesta previsualització PNG del fitxer SVG: 660 × 480 píxels. Altres resolucions: 320 × 233 píxels | 800 × 582 píxels | 1.024 × 745 píxels | 1.280 × 931 píxels. 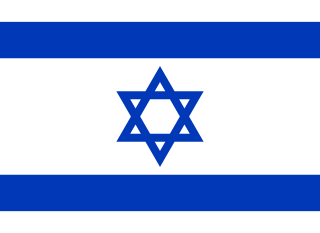 English: Flag of Israel. Shows a Magen David (“Shield of David”) between two stripes. The Shield of David is a traditional Jewish symbol. The stripes symbolize a Jewish prayer shawl (tallit). Ladino: La bandeira de Israel. Muestra la Estrella de David. “The Provisional Council of State Proclamation of the Flag of the State of Israel” of 25 Tishrei 5709 (28 October 1948) provides the official specification for the design of the Israeli flag. The color of the Magen David and the stripes of the Israeli flag is not precisely specified by the above legislation. The color depicted in the current version of the image is typical of flags used in Israel today, although individual flags can and do vary. The flag legislation officially specifies dimensions of 220 cm × 160 cm. However, the sizes of actual flags vary (although the aspect ratio is usually retained). A photograph taken on 24 May 2008 or earlier — the old British Mandate act applies, i.e. on 1 January of the 51st year after the creation of the photograph (paragraph 78(i) of the 2007 statute, and paragraph 21 of the old British Mandate act). If the copyrights are owned by the State, not acquired from a private person, and there is no special agreement between the State and the author — on 1 January of the 51st year after the creation of the work (paragraphs 36 and 42 in the 2007 statute). Vegeu també la categoria : PD Israel & British Mandate. This image shows a flag, an emblem, a coat of arms or some other official symbol which was declared a protected symbol in Israel. Regardless of copyright restrictions which may or may not exist on this design, it should be used according to the Israeli Flag, Emblem and Anthem Law (1949), or the Israeli Protection of Symbols Law (1974), and according to the ordinances promulgated pursuant to these two laws. Aquesta imatge vectorial ha estat creada amb un editor de text. The coding shows the geometric structures. http://www.science.co.il/israel/Flag.php specifies each side as 60 cm. the flag, at a distance of 15 cm from the top and from the bottom..."
18:36, 13 ago 2008 660 × 480 (2 Ko) Technion Fixed a minor bug that led to rendering problems in browsers with less robust SVG support; adjusted the color to be closer to the deeper blue used in Israeli flags; see discussion page for more info. 21:35, 2 des 2007 660 × 480 (2 Ko) Technion Adjusted color to be closer to the letter of the flag legislation and to match more closely the deeper blue used in modern Israeli flags.